Little is more luxurious than serving scrambled eggs for breakfast, am I right? But what if you switch out the eggs with tofu? Having heard so much about this twist, I of course had to give it a try! And Sarah´s recipe at makingthymeforhealth was definitely a hit! Whether you’re vegan, vegetarian or simply just interested in trying to eat more plant-based, give it a try. 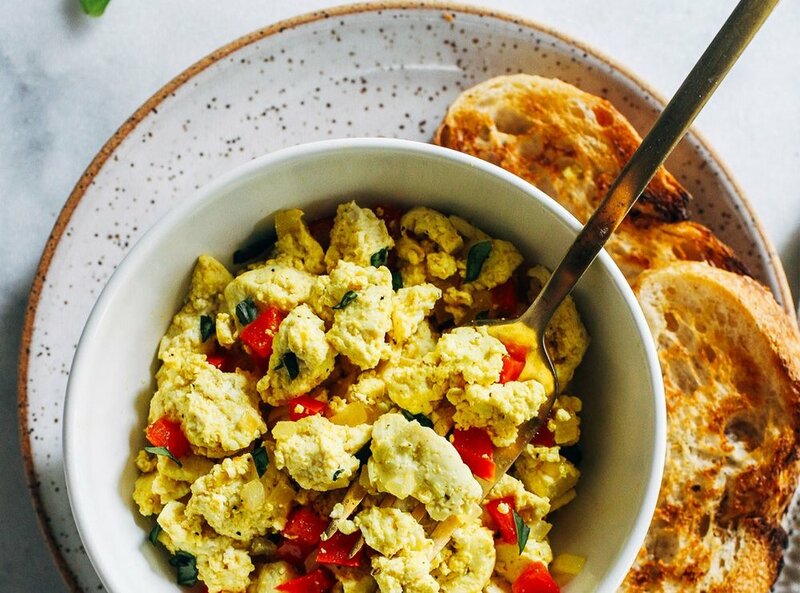 Fun fact: The turmeric gives it a light yellow color that resembles scrambled eggs! Cover a baking sheet with paper towels and crumble the tofu into small pieces on top. Let drain for about 20 minutes, before gently pressing with paper towels. In a large skillet, warm the oil over medium heat. Add the bell pepper and shallot and cook until softened. Stir in the crumbled tofu with salt, turmeric, and pepper. Cook until hot, about 3-5 minutes. Add fresh basil then serve warm.